i have not added any new photos in a while but the link below shows some of my past photo exploits. check the Mainline East thread for the shot of Greenport Station from the Rail Road dock. Wave to Don! Nice job reorganizing the slide show. GREAT PICTURES! You've captured the essence of the ride folks can take on the "Greenport Scoot." To all the readers on this Forum - if you have never taken the ride from KO or Riverhead east, you owe it to yourself, your friends and your family to make the trip. Some of the best - most beautiful RR scenery and trackage east of the Mississippi. Remember too that this is "Block Territory", no automatic train control - railroading the way it used to be! I encourage you to make a weekend daytrip this spring - summer - fall. Along with the great trainride, enjoy Riverhead, the Greenport waterfront, the Museums and the FOOD! The Cannonball goes to Montauk. There once was a Shelter Island Special that went straight from Jamaica to Greenport with parlor cars and whatnot but no more. The Scoot goes to Greenport (From Ronkonkoma). The Current timetable has two round trips every day (one each way on Sat. and Sun.) Standard consist is two C3 coaches with a DE 30. There is an abbreviated Scoot that makes a trip between Riverhead and Ronkonkoma weekdays as well. Peak hour fare one way is $19. $22 if you pay the conductor on the train. I've had many memories as a kid taking the Greenport Scoot from KO to Greenport with my father. It would be two cars with a Geep on one end and an MP on the other. Sometimes it would be an MP on each end, but I loved the Geeps as a kid. I looked forward to riding in between the P72 cars and watching the conductor pull up the trap door to let passengers off to the low level platforms. Nothing beat a Saturday spent with my dad doing what I love... riding trains. I'll never forget any of it. It's not the same nowadays, but riding the line to Greenport is the only bit of real railroading left on the island. Actually, BingDude, it's 4 trains each way on weekdays and 2 each way on weekends. The run from KO to Greenport is just increadible. You would think you were on Amtrak rolling through Kentucky. I really just wanna film the whole thing sometime. The best part, IMO, is that pond or w/e that the train goes over. The first time I went over it(Joe, you might remember me saying this), I was certain the rails were resting on the water or some sort of float. It's increadible. Current weekday schedule shows two outbound and three inbound trains from Greenport with an additional outbound train on Fridays during the summer season. All require a change at Ronkonkoma. I believe there is additional weekday service between Ronkonkoma and Yaphank or Riverhead. I agree. East of Yaphank the route is a delight, as you ride through the Pine Barrens, run past vineyards and farms and along the Peconic River and other tributaries of Peconic Bay. An ideal excursion is to take a bicycle along and then ferry across to Shelter Island. Also, Greenport is a nice town to walk around with cool restaurants and shops. And, in Riverhead you have the RR Museum of Long Island. As was noted on weekdays there are 2 eastbound trains to Greenport and 3 westbound trains from Greenport. There is also 1 eastbound 'dead run" to bring out equipment for the 5:30 AM train from Greenport. In addition there is one round trip that only operates to and from Riverhead and one extra east bound trip to Yaphank. This pathetic, stupid, and out of date schedule is due in part to the fact that the LIRR protects this service with only 1 trainset (1 Diesel Loco and 2 bi-levels), the other factor being that the LIRR has yet to get it's head out of the sand and realize how the profile of the North Fork has changed in the last 5 years. The railroad looses hunderds of riders EVERY DAY who by default use the Sunrise Express Bus Company, and others wind up driving to Ronkomkoma (and in turn clog the LIE). The weekend schedule of 2 round trips (to/fr Greenport) can work for the weekend crowd coming from the city (or in-island), but is useless for local residents looking to spend the day or weekend in the city, or to other points for that matter. unused. When I park at Southold I am so close to the train that I can almost jump from the platform to the car. Yes the ride is senic (east of Yaphank), and the section along the shores of the Peconic River is a unique view every time, BUT the LIRR is SUPPOSED to be providing essential transportation to all of LI, and along this branch it FAILS and fails bad at delivering this. Happily we know have the backing of our local officals (Tim Bishop, Fred Theile, and the like) and based on the dollars that Riverhead and Southold towns send to the MTA (via the Realty tax) we are far from getting the proper proportion of service back. BTW, the latest LIRR excuse is that they do not have enough of the new Diesel Equipment to go around!!. (Yes, leased equipment would be fine for the Greenport Branch). Yet the LIRR is going to be running close to 6 more trains on the Montauk Branch for the US Golf Open at Shinnecock Hills, needless to say we do not buy Dermody's statement that they do not have enough equipment. PS yes we have an extra east bound train on Fridays from Memorial Day through Mid-October, and it requires a second train. My bad. I was talking about the number of north fork departures/arrivals from KO. Sorry. RMLI also has a site at Greenport. 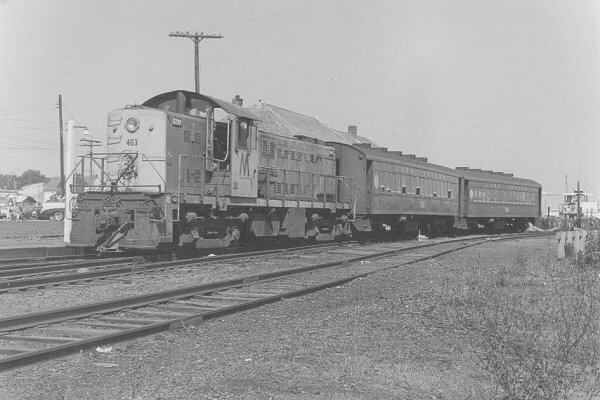 Here's the 2-car "Scoot" at the Greenport depot back in 1972 as she's boarding the few passengers headed back as train #4211. We rode out to Greenport as train #4204 with all the windows and end doors open. It was hot as all hell. Riding through the fields churned up dust which blew everywhere. The conductor sat in the last seat of the rear car, smoking his cigar and spitting on the floor every few minutes. Upon arrival, the crew closed the windows and locked the cars to avoid vandalism and/or vagrancy while she laid up at Greenport for several hours, waiting for the return trip. I remember the experience vividly!!! I've added some new photos from my trip this weekend out to my folks. It was a great weekend for picture taking, excellent light and VERY comfortable temps. It was good to see you at Greenport. I invite all of the RR.Net Forum Members to shout hello when they come to Greenport on a summer weekend, I'm in the station plaza Friday nights and during the day on Saturday. Please say Hi! Please note how clean the "end of track" bumper is. I will endeavor to keep it that way this summer. The film crew, director and actresses arrived in time to "shoot" the 5:05 PM as it arrived in Greenport. They spent an hour following the arrival to film the actresses on the platform and around the station. As part of the new photography concerns, the police were checking photo identifications and vehicle license information on the film crew and their cars. An officer stayed "on location" to provide further security. The filming went well and once the train left at 6:17 PM, the crew packed up and went back to NYC. <----best German accent... Your papers please.